How did 60 Minutes in the US film their recent segment on free solo climber Alex Honnold? For such a dangerous and unique assignment, only the best would do. First, a primer: Free solo climbing is the purest form of climbing there is. Climbers use no ropes or tools of anykind, save maybe a chalk bag to combat moisture and some rubber climbing shoes. Very few climbers ever "graduate" to this level, mostly for the obvious reason, that being a horrific death if something, anything should go wrong. You should note this is not "free climbing", which involves safety gear so long as it does not assist with the climb. Filming this fearless activity requires an equally fearless film crew, one that is equipped with a variety of automated cameras and other assorted gear. 60 Minutes correspondent Lara Logan, producer Jeff Newton (a climber himself) and Peter Mortimer of Sender Films (who has made a movie about Honnold) took about two days to set up the cameras and rigging used in the segment. The team also needed to be extremely careful around Honnold as he ascended, hence the special instructions about not changing location or position until he had climbed past. 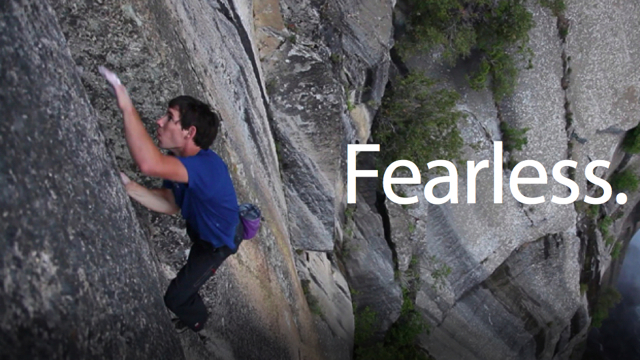 Errant stones or distractions could have meant death for Honnold as he climbed. Watching Honnold climb a sheer cliff face was unnerving enough for me, and I was on a couch. I can only imagine what it was like for the 60 Minutes film crew. See the "overtime" segment that explains how they set it all up in the video included here.